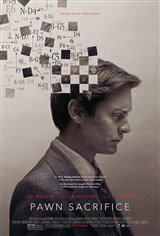 Bobby Fischer was not a likeable character but I felt that Tobey Maguire played him quite realistically. I recall when this story was on the news often and the publicity was constant and Bobby was never portrayed as a great person , ONLY AS A GREAT WINNER!! He sacrificed his life for Chess not just his pawn. Why wasn't this converted to 3D! Watch out for that Rook... Quick move, that Pawn almost hits you! jk. Of all the chess movies out this year, this is the best. Ok seriously, I'm sure it was hard to film chess games and keep the audience rivited. A LOT of chess piece and Tobey's face close ups I didn't enjoy. But seeing the game make him and his greatest rival go a little mad was interesting. The Cold War era, mixed with a game where you need to think of hundreds of moves ahead of your opponent, while still attacking him and mixed with new found celebrity, I totally felt the psychological realism. New releases this weekend - The Intern, Hotel Transylvania 2 and more!